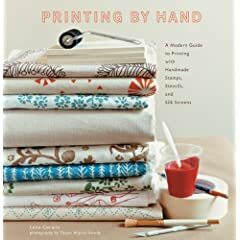 Has anyone ever printed on fabric before? You can make some pretty amazing things. There's this skirt giveaway here, for example. I'd love to have you on deck! Yes, Ann has. She did made a really great skirt. That looks like a wonderful book! I can't believe you remembered mom! It is very fun to do. Have you started on anything? Really? I just might have to get on board with you. I've always wanted to learn how to do things like this. Ann, I need you here to give pointers. No I haven't started on anything yet. Hopefully this week...post birthdays. Rachel, I'm so glad you commented! Thank you for your kind words. I printed on fabric once, but not by hand. I used a printer. It was really really hard--but that was about 8 years ago. I wonder if I'm up for it again. I can't wait to see what you do.